﻿ NIRF 2019 ranking: IIT Madras tops in overall category; 6 DU colleges in top 10 colleges list. NIRF 2019 ranking: IIT Madras tops in overall category; 6 DU colleges in top 10 colleges list. 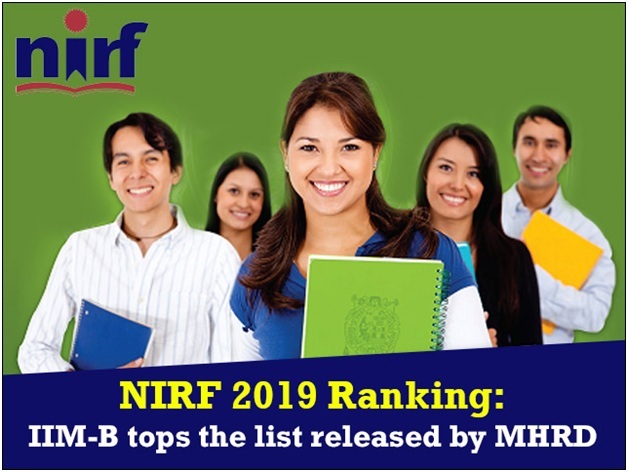 The National Institutional Ranking Framework (NIRF) has released the 2019 rankings of higher educational institutions across the country. IIT Madras has topped the overall category in the Ministry of Human Resource Development (MHRD) rankings and has also become the number one institution in the first edition of Atal Ranking of Institutions on Innovation Achievements (ARIIA). Meanwhile, in the overall category, Indian Institute of Science (IISc) has dropped down to the number one position to the second rank in the overall category. IIT Delhi, however, stands at 3rd place. A total of seven IITs are placed in the Top 10 overall category. Delhi University's (DU) Miranda House has topped the list of colleges across the country. This year, DU colleges have performed better in the MHRD rankings with six of them being placed in the list of Top 10 colleges. Last year, only five DU colleges were placed in the top 10 category. As per the rankings released by the ministry, Miranda House has retained its first position for the third consecutive year. Meanwhile, Hindu College has moved up to second position and St. Stephens, which was earlier placed at 2nd position, has dropped down 2 ranks to be at the 4th place. The other three colleges are Lady Shri Ram College for Women at 5th rank, Shri Ram College of Commerce (7) and Hans Raj College (9). In the list of top universities across the country, Indian Institute of Science (IISc), Bengaluru, stands at first place followed by Jawaharlal Nehru University (JNU) at second place. JNU is the only university from Delhi to have been placed in the Top 10 Universities' list across the country.